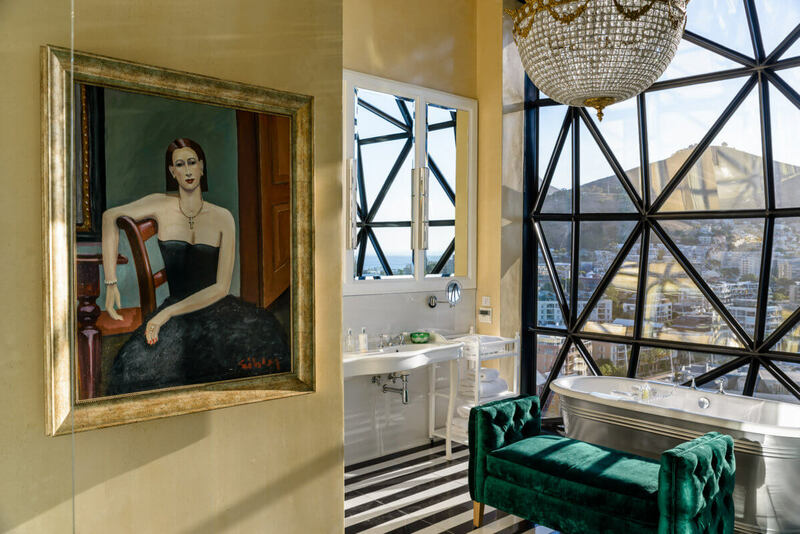 Meticulously selected by the owner of The Royal Portfolio and avid art enthusiast Liz Biden, The Silo Hotel houses some of Africa’s most talented, emerging, and eminent contemporary artists. Zeitz Museum Of Contemporary Art Africa (MOCAA), situated below The Silo Hotel opened its doors in September 2017. The museum joins the likes of the Tate Modern in London, MoMA in New York, and Museo Nacional del Prado in Madrid as a key destination attraction for locals and international visitors alike. 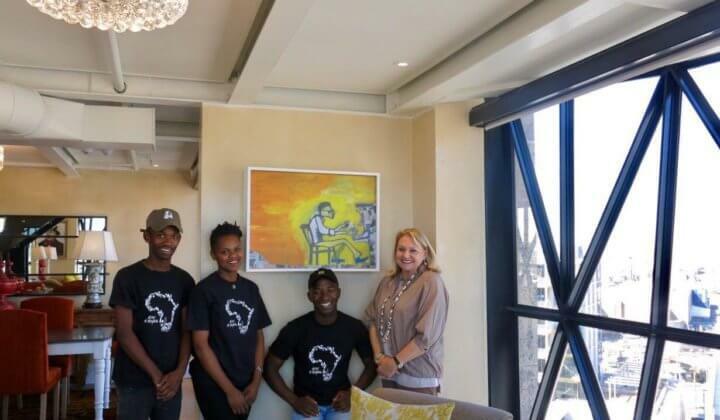 During her trips throughout Africa, aided by her well-travelled eye for the exquisite and the unusual, Liz Biden has acquired a unique and varied collection of art that complements that of Zeitz MOCAA. Highlighting both young, aspiring artists, as well as established, highly acclaimed artists such as Cyrus Kabiru, Mahau Modisakeng and Nandipha Mntambo, art has been specifically chosen to complement the unique interiors of each of the 28 rooms, offering individualised experiences for guests and many a reason to return. 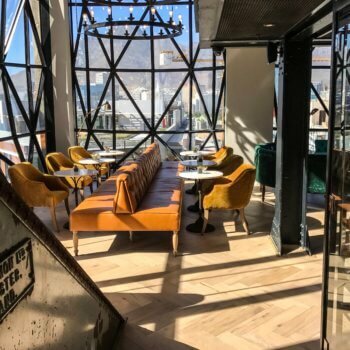 Located on the ground floor of the silo building, The Silo Hotel lobby sets the scene for the contrast between old and new showcased throughout The Silo Hotel. Suspended from the double volume ceiling hangs Haldane Martin’s contemporary chandelier, juxtaposed against the original grain hoppers. 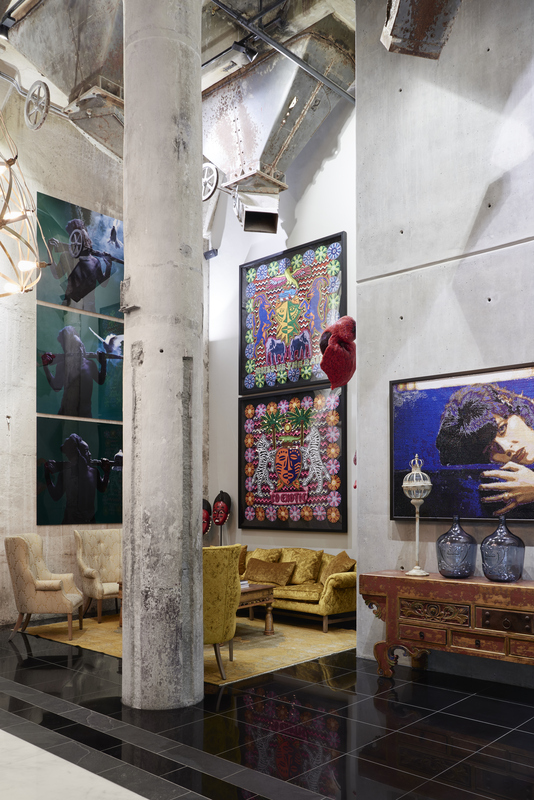 Mohau Modisakeng’s Ditaola series and commissioned pieces by Jody Paulsen, Must be the Rain and So Exotic, and Frances Goodman’s Blue Velvet and Hooded Lady I, II & III adorn the walls of The Silo Hotel lobby as well as a vibrant piece by Athi Patra Ruga behind the lobby desk. To the right of the elevators is a magnificent piece by Zimbabwean artist, Kudzanai Chiurai. Atop the desk you will see the original mask created by Cyrus Kabiru and used in the three images that you will see opposite the elevators on the lobby level. The mask, titled ‘Mbili Uso Macho Nne, Damien Hirst’, is part of his ‘C-Stunner’ series, evidencing intricate, handmade eye-wear and self-portrait photographs. The meticulous masks are fashioned from urban debris and discarded or obsolete technology that Cyrus carefully selects and imaginatively re-contextualizes. Continuing up to Level 6, among the eclectic and whimsical design of the Willaston Bar and the Granary Café guests will find interesting pieces by the likes of Pierre Carl Vermeulen, Georgina Gratrix, Kudzinai Chiurai as well as Pieter Hugo’s thought provoking Hyena and Other Men photographs in the guest library on the mezzanine level. 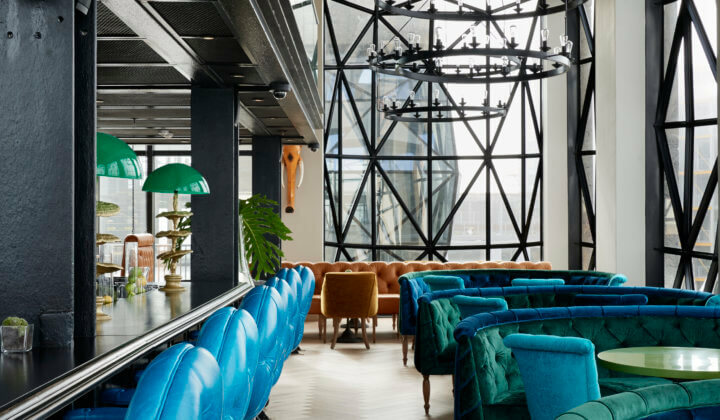 Colorful, contemporary African art, and an original machine head emerge from what was once the distribution floor of the grain silo working house, now the Willaston Bar. Below images courtesy of Thania Petersen and Georgina Gratrix. Art is not the only feature to be admired at The Silo Hotel. Almost every piece of furniture has been hand crafted by Moorgas & Sons in Cape Town. Liz will find a material or fabric that she enjoys and turn that into something special. The headboards in every room for example are completely different – each hand made. The headboard in room 603 incorporates a beautiful leopard print from Ardmore Ceramics first range of fabrics that is also being used by Hermes in their scarves. 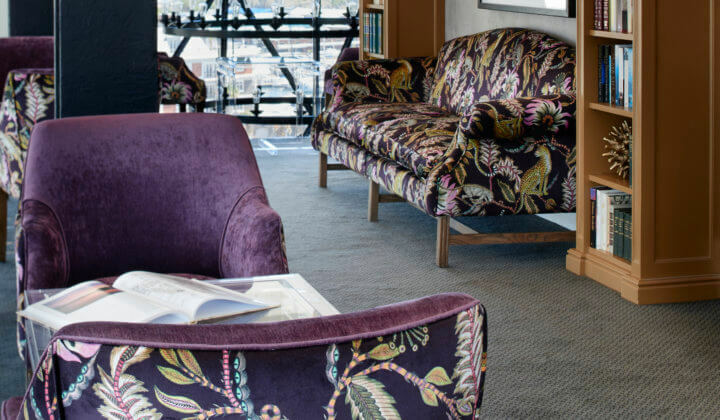 Likewise the chairs and sofas in the library are made using Ardmore’s second fabric range. Each room adopts its own quirky colour-scheme, sparked by something different within each space. The colour-scheme could stem from a piece of fabric, a carpet or even a painting. The Willaston Bar for example took shape around an exquisite, soft, teal, Italian leather that Liz found on her travels. These became the bar stools. Initiated in 2001 with just a handful of township students from Hangberg and Imizano Yethu in Hout Bay, Cape Town, the Lalela Project now provides education through the arts to hundreds of children between the ages of 6 right up into their departure from high school. Now working in 11 communities throughout South Africa, Northern Uganda and the South Bronx, the organisations uses the power of art to aid students along a clear path while helping them avoid the hazards of extreme poverty, including gang violence, HIV/AIDS, and physical and substance abuse. Images courtesy of Mohau Modisakeng, Nandipha Mtambo, Cyrus Kabiru, Pierre Carl Vermeulen, Kate Gottgens, Jody Paulsen, Thania Petersen, Frances Goodman, Sibley McAdam, Carla Kranendonk, Stevenson, SMAC Gallery, and Lalela Project. The Vault is The Silo Hotel’s small and exclusive art gallery located in the private parking entrance on basement level P3. Read more about private gallery in The Vault here.